Rafael Nadal has suffered a wrist injury less than a month before the start of the US Open in New York. The Spaniard, the reigning champion at Flushing Meadows, will be out of action for two to three weeks after hurting his right wrist in training on Tuesday. Nadal, 28, will not defend his titles in Toronto and Cincinnati as he targets a return to fitness in time for the US Open, starting on 25 August. "I'm extremely disappointed that I am unable to defend my titles," he said. Nadal has not competed since his shock defeat by Australian teenager Nick Kyrgios in the fourth round at Wimbledon on 1 July. 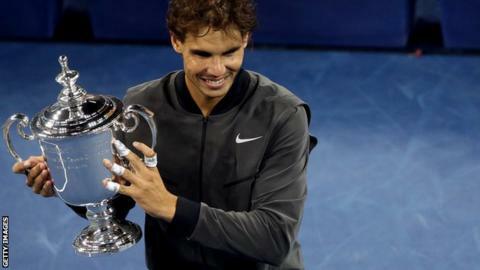 The defence of his crowns in Toronto and Cincinnati were key hard-court season warm-ups ahead of the US Open, where Nadal will go in search of a 15th career Grand Slam crown. "Unfortunately I injured my right wrist on Tuesday during practice," the world number two confirmed. "After the tests I have undergone in Spain, including an MRI and checking with my doctors, I will have to stay out of competition for at least two to three weeks." The Toronto Masters starts on Monday, with the Cincinnati Masters getting under way the following week.